Clergy Confidential: Is Snark Un-Christian? “Snark” is one of those wonderful terms born of the internet. It reminds me of some of those great Yiddish words that sound like what they mean – like klutz, shlep, and schmuck. The word is basically a synonym for sarcastic, an amalgamation of “snide” and “remark.” Depending on your perspective, to call someone “snarky” is either a compliment of the highest order or a derogatory term for an overly negative person. Snark often plays out on social media as a sort of public gallows humor. You can spot it on Facebook though it’s more prevalent on micro-blogging sites like Twitter that offer opportunities for real time back and forth repartee. Some clergy are particularly adept at snark, making cutting comments about everything from liturgy to church meetings to the seven habits of the highly dysfunctional. At its best, snark highlights deeper truths that bubble just beneath the surface in a humorous manner. When engaged in a lighthearted rather than angry way, snark can be a delightful respite from the profound responsibilities of ministry. Indeed, I’d contend that true snark, while at times acidic, is never without a degree a levity. Christians with a predilection for online snark occasionally encounter pushback from those who don’t think it’s appropriate. The best snark comes right up to the line without crossing over it and that can push people’s buttons who expect more positive output from their clergy and lay leaders. This all begs the question: Is snark un-Christian? If you get back to the original definition of “sarcastic,” I don’t think you have to look much further than Jesus himself for validation. While it’s rarely put this way, Jesus had a wicked sense of humor that made extensive use of both hyperbole and sarcasm. If Jesus was Tweeting I'm pretty confident he'd be a master of the medium (though I doubt he'd have as many followers as Justin Bieber). There are countless other instances of Jesus using a cutting remark to make his point and, yes, he also got a lot of flack. Obviously I'm not comparing snarky Christians to Jesus but there is a place for snark in the Church. Snark, like all humor, simply looks at life and faith and ministry from a slightly different angle and we all need that. Ultimately it's about taking our faith but not ourselves too seriously -- which is critical to the health and vibrancy of the Church. I've been both accused of and lauded for my degree of snarkiness. Much of it is simply personality and the internet allows me to share this "gift" with a wider group of people. I take solace in the fact that it's something that people can opt out of by not following me on Twitter or not reading my blog or not friending me on Facebook. In other words, it's snark-optional. Of course, if you're into this sort of thing I also have some Twitter clergy folks you'll want to follow: Laurie Brock @drtysxyministry, Scott Gunn @scottagunn, Megan Castellan @revlucymeg, David Sibley @davidsibley, and Anne Lane Witt @VaPriestess. Oh, and a couple of anonymous snarkers: @ChurchSnobTEC and @MapleAnglican. Your life will never be the same. So snark on, friends. You're in good company. First, I am astonished that you would recommend following your arch-nemesis! I just don't know how to take that! Second, I'm a little disappointed that you didn't go for words like "snarkastic" or "snarcasm" - nothing like coining a new phrase! And finally, on the topic of Yiddish, I drove a parishioner crazy over the course of our yard sale preparations by repeatedly using the word "tchochkes" (sure hope I spelled it right!). Not snarky, really, but fun. - ORIGIN early 20th cent. : from dialect verb snark ‘snore, snort’, ‘find fault’. Snark: noun an imaginary animal (used typically with reference to a task or goal that is elusive or impossible to achieve): pinning down the middle classes is like the hunting of the snark. I bet Jesus would keep it under 140 characters, but I doubt Paul would. a surly non-blinking stare that signified (at least to me) utter contempt. 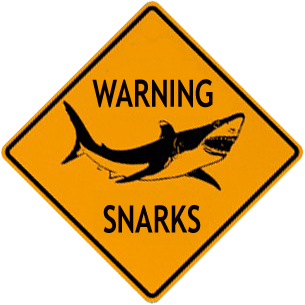 This is to say that the use of "snark" is one of the few defense weapons, somewhat akin to mine, available to clergy and I truly believe that you, dear Padre, are a past master of the proper use of the word.....dare I even say, a past/present/and future master? I suggest you use it to your heart's content. (Aren't you the guy who wore the "surly waiter" button at the Boar's Head Festival?) Thanks for the definition of "snark" - though I'm not sure all snarkheads practice it the way you define it. And Jesus was only sarcastic to those who deserved it. BTW, your comment about Bieber reminds me of John Lennon's comment a generation ago - "the Beatles are more popular than Jesus" - which was taken WAY out of context.